Gotta love some time lapse! LA photographer, Colin Rich, explains the elaborate processes he uses to get the job done in the LA Times. 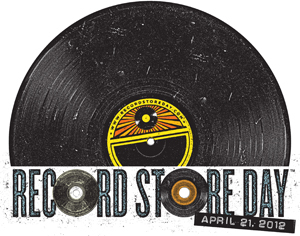 Record Store Day is the sixth annual international celebration of independent record retailers. All over the world, record stores will be organising barbecues and face-painting, hosting bands, and selling unique music unavailable anywhere else. The independent record store is one of the only places you’ll get to hear local, new music, talk to an expert in a particular musical genre, hang out with like-minded fans, get details of gigs and exclusive tracks, find rare and vintage records. In the face of high street chains (who then all went bust, RIP Our Price, Tower Records and HMV), and the transition to downloading digital music, rather than buying physical records, a lot of these small stores, run by enthusiasts, have managed to keep going, even through economic recession. They represent community and culture, and the music industry would be much the poorer without them. They deserve to be celebrated! Find the independent record store nearest to you via Record Store Day, and a list of the exclusive tracks that will be available via these small retailers. And don’t forget that the official brew is Revolver Beer. Customers are expected to start lining up for the bonanza at 7am, and there will be long queues all day, so plan accordingly. If you’re in Leeds, my friends at Jumbo Records (5/6 St. John’s Centre) have a number of offers and in-store events throughout the day. In addition, Lanterns On The Lake are releasing ‘Low Tide’ on 12″ white vinyl which includes a MWC remix and Laurel Halo, Dauwd, Sun Glitters, Young Montana and Damu.